A terrible winter storm strikes the Texas Panhandle. Down at Slim’s place, Hank and Drover listen to the wind howling outside, watching the snow pile up outside. The phone rings. It’s High Loper. Baby Molly has a bad cough and needs medicine. Can Hank go out into the blizzard and make it all the way to Headquarters with the cough medicine? Or will he be captured and eaten by Rip and Snort? 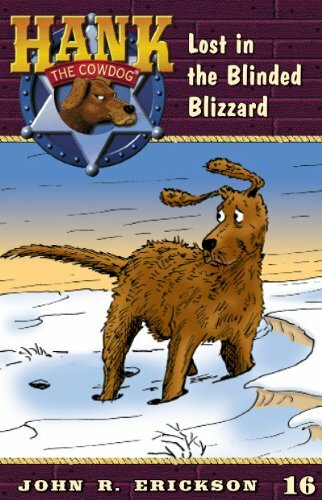 This is definitely one of my favorite Hank the Cowdog books. I do not know why exactly maybe it’s the coyote’s song, “We don’t Give a Hoot”, or the way Hank gets elected to deliver medicine to baby Molly. While the blizzard in the middle of Texan panhandle helps make the story, Hank’s troubles, trying to impress Miss Beulah allows for many smiles and laughs. This book has some mild humor and language. It also has an Owl, who claims to be witch and Hank believes her even though she is unable to scare the coyotes. She does manage to help lead Hank to Ranch Headquarters in the snow.